Children love pilgrimages to Orthodox Christian monasteries, as any Orthodox parent who has taken their kids to one can tell you. These books help reveal why. Maybe it’s the total simplicity, beauty and peacefulness of the surroundings, or perhaps it is because the nuns or monks themselves have a child-like quality about them which allows children to relate to them with ease. Or maybe it’s because being at a monastery is like being at church, but even more! Whatever the reasons, children love monasteries! The first is In the Candle’s Glow, by Elizabeth Crispina Johnson, illustrated by Amandine Wanert. Our 8-year-old granddaughter loves this book. She’s read it over and over, and even took it to church with her. I especially like that this book teaches us where the candles in church come from, the emphasis placed on the Jesus Prayer as well as the Lord’s Prayer and the prayer for family and friends, and even that it helps us remember to bless the bees, and ask God to care for them. Here is an outstanding resource for Orthodox Liturgical Music, created by an American monastic. 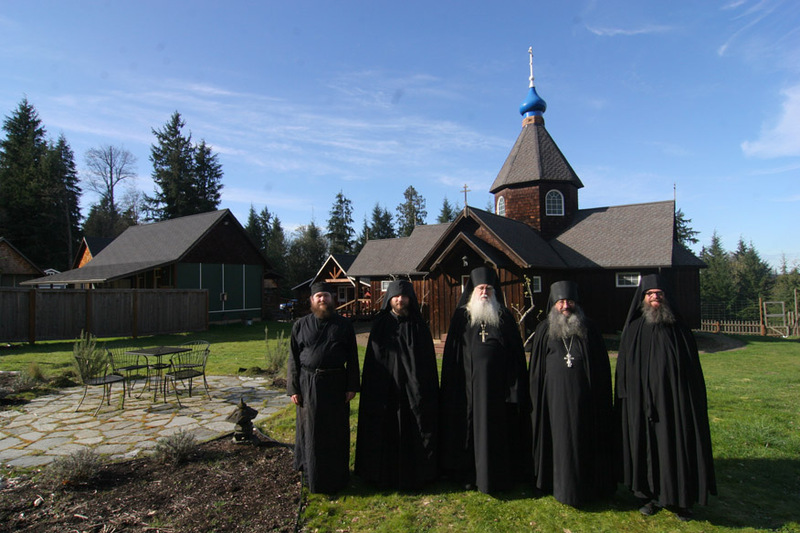 Fr Abbot Tryphon (center) and the Brotherhood of All Merciful Saviour Monastery, Vashon Island, Washington. When I was on pilgrimage at Archangel Michael Monastery in Canones NM in Autumn 2014, I recall being surprised by the compunctionate and familiar tones of some of the chants the brothers sang during Matins. Came to find out that one of them had been at St John of Shanghai & San Francisco Monastery in Manton CA, and brought with him a familiarity with the music on their beautiful CD, The Eyes of All Look to Thee with Hope. So, when I recently happened across Monk Martin’s website, Orthodox Music, which includes sheet music for the hymns on the CD, plus much, much more, I was doubly intrigued. Not only do I long to return to Archangel Michael Monastery in New Mexico, but now I am even more desirous of making my first pilgrimage to All-Merciful Saviour Monastery on Vashon Island, from where Monk Martin hails. Alaska. St Herman. Pilgrimage. How I yearn for this! Here is a great video of a recent St Herman Pilgrimage. Scroll down for the news announcement from the OCA website. Hundreds of faithful are expected to participate in the 47th annual Saint Herman Pilgrimage to Spruce Island, home of North America’s first saint, August 7-9, 2017. I have been using this outstanding book as a resource in planning my travels for the North American Thebaid Photographic Pilgrimage since the Atlas’s publication at the start of 2016, and downloaded this digital edition onto my iPad immediately after it was announced. The linked table of contents makes navigation a delight, and the ability to search the text likewise makes this an even more powerful tool than the already excellent print edition. Once you download the PDF file, you can easily import it into your Kindle or iBooks library, or most other ebook readers. I have always felt the timing of the Atlas to be uncanny, as I had begun planning the NA Thebaid Project almost a full year before Krindatch’s Atlas was published. Now this digital edition comes out just as I am resuming travel and photography after a brief hiatus. Our twin efforts clearly herald a growing vibrancy in and awareness of Orthodox Christian monasticism in the USA and Canada, and my hope is that the Atlas, the North American Thebaid Project (and the finished Thebaid book, due in Autumn 2018), and similar future efforts, will help inspire Orthodox monastic vocations, as well as draw spiritual seekers to the Orthodox Church, inviting them to “come and see” the ancient and timeless Christian Faith, which was “once for all delivered to the saints” (Jude 3). The electronic version of the widely popular Atlas of American Orthodox Christian Monasteries has been released by the Assembly of Canonical Orthodox Bishops of the USA and made available free of charge to everyone. The PDF file with the Atlas can be downloaded free of charge here. The hard copy of the Atlas can be purchased directly from the publisher, Holy Cross Orthodox Press. An enticing travel guide for those seeking to visit American monasteries and to “sample” monastic life. In addition, twenty-two featured monasteries share their personal stories and offer a glimpse into the surprising spiritual appeal of monastic life in 21st century America. 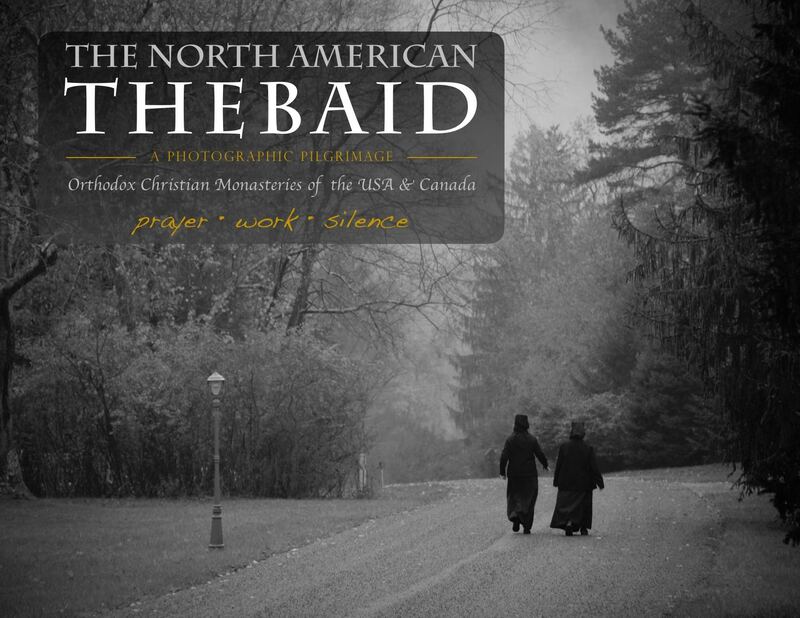 A special update on the North American Thebaid Project, especially coming off this recent “quiet” period during Great Lent and the Pascha/Easter season. Actually, there has been a great deal going on in the background, most of which is sketched out below, and you’ll see why I didn’t feel it was worth posting about at the time, as the details seem rather dull on the surface. But when it is all pulled together now, it makes for a good narrative, and helps relate the causes of my absence, as well as my eagerness to resume travel and photography. Temp Job & Auto Maintenance — The Thebaid Project has been quiet recently primarily due to an unexpected fundraising opportunity. Thanks to a referral from one of the project’s main advisors and supporters, I was able to take on a full-time administrative temp job for three months, in order to raise extra funds for the Thebaid project. This proved to be doubly providential, enabling me to take care of some major (and unexpected!) car maintenance (battery, alternator, belts), over and above normal service. A commitment from another supporter to replace two tires showing wear and dry-rot (we replaced the first pair of tires in September 2016) means that my vehicle should be quite roadworthy for the remainder of the project travel through mid-2018, God willing. And, I will still benefit from modest savings from the temp job gig. Had I pressed forward with travel instead of accepting the job offer, I might very well have had a breakdown on the road, with added expense due to hotel stays and possible towing beyond my AAA coverage. Thanks be to God! Travel & Photography to resume in July — I am currently firming up details on the major legs of the pilgrimage: the Northeast, Midwest, the Northern Plains, Pacific Northwest and Alberta Canada, and California. Alaska timing is uncertain at this point. I am planning to cover the Southeast and Southwest in Late Autumn and Winter, following the seasons. My intent is to have the photography completed by April or May 2018, and be in a position to send the book to the printer by June 2018.